The size of a standard iPhone has stayed the same between generations, with the iPhone X and iPhone XS boasting a 5.8-inch display – but that might not be the case for much longer. According to a report by Digitimes, the series of iPhones that will release in 2020 (the iPhone 12) will be smaller than current iPhones – the smallest handset will have a 5.42-inch display, stepping up to 6.06 inches and then 6.47 inches for larger devices. In comparison the iPhone XS, iPhone XR and iPhone XS Max have 5.8-, 6.1- and 6.5- inch screens respectively. What's coming with iOS 13? The report is based on sources from Apple’s component supply chain, and they add that the company is still unsure whether to stick to Samsung-provided displays or defect to LG for its touch technology. What does this mean for the iPhone 11? 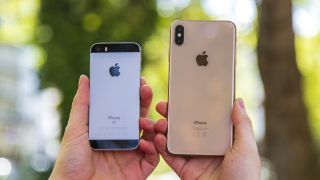 According to the report, the upcoming iPhone 11 series expected this year will stick with the same sizes as their iPhone XS counterparts, so if you’re not a fan of smaller phones you’ve got one generation left to enjoy chunky handsets. This also means 2020's iPhone 12 could have smaller batteries, to fit in the smaller bodies, but if Apple is working on tech to optimize battery life we could see this in the iPhone 11 too. However given so many iPhones have been the same size, and that new smartphones are constantly boasting bigger and bigger screens, we’d be a little surprised to see a smaller iPhone 12 – we’ll have to wait until 2020 to see whether the report is accurate.